Waking up at daybreak (well, its more like 4am) on Mahalaya has been, and still is, an annual ritual for most of Bengali households. When you are in Bengal, or say in states adjacent to Bengal (Bihar, Jharkhand, Orissa, Assam), the (ei-4te-baje-uthe-ja) must-wake-up-at-4am is probably implemented more strictly than elsewhere. Predictably, if you don’t have strict enforcement of this widely practiced rule at your home, your Mahalaya would be way different. The approach to celebrate Mahalaya at Bangalore (or say, Delhi, Mumbai or Hyderabad) is way different than that at Kolkata (or even Jamshedpur, Guwahati, Bhuwaneshwar or Patna). This post is a short account of how an immigrant Bong spent his Mahalaya in the IT City vis-a-vis how a pakka Bongo Tanaya spent hers in the Bengali heartland (Kolkata, where else?). Went to bed at 2 am, so waking up at daybreak was obviously out of question. Other flatmates also wanted to enjoy Mahalaya chants, but Kalyan banging their doors at 6 in the morning was a strict no no. So we agreed on a protocol. After 8am, whoever wakes up first will SMS the other flatties (Don’t Bang my door please, just ping me ok!). At 8:30, the dont-bang-my-door-or-I’ll-shred-you warning would be called off and people then may start celebrating Mahalaya. So, instead of 4am, it was 8:30 am. Received an SMS saying this at 8am. Startled, I woke up. I smiled at the changed times. Birendra Kishore Bhadra’s Chandipath is a number now. 🙂 Much like Dhanno in Housefull or Lady Gaga’s Bad Romance (please, I can’t name that Bieber fellow in the same breath). I found it a fresh and contemporary approach to complementing the goose bumps inducing Agomoni songs. What better a tribute to the traditional than to acknowledge that it is still ‘hip’. The guy would be proud in his afterlife. Not sure if he ever imagined people born eight decades later (he was born way back in 1905) in weird places would be listening to his Mahishasurmardini songs at 10am over not a radio or television, but something weird as a website on a laptop. Not even sure if Akashvani (AIR) would have thought that what started as a tradition way back in 1930 would even continue 80 yrs later, albeit in several other formats. The Immigrant Bongs and the I-have-many-Bengali-friends junta then followed it up with Phuchka-meets-Dahi-Bhalla. A slightly different version of the quintessential Bengali Phuchka. Boil the potataoes, mash it with some powdered spices, salt, Tamarind water (Imli ka paani) and boiled Mung Daal. Mix curd with whatever spices suits you and fill in each Phuchka (golgappa, pani puri) with the curd mix, mashed potato mix and Tamarind water. East meets West baby! Followed it up with Mughlai Paratha for lunch at Calcutta Tiffins at a nearby Spencers. Was okayish, but nothing close to the Mughlai Paratha Sudeshna made. Its not without reason that the post is one of the most popular posts ever at Cook Like a Bong. Now, coming to the other end of the Spectrum. Went to bed at 1am excited that Devi is finally arriving ina few hours. Wanted to do something more than the regular Ishh-ki-bhalo-Chandipath-cholchhe-radio-te (whoa! Awesome hymns on radio). Mom woke me up at 4 am. Mahishasurmardini was already loud on TV. Bengali Agamani songs were playing aloud in my mind. While people elsewhere (Probashi Bengali) rely on Google etc for Birendra Krishna Bhadra’s Mahalaya Songs free download link, I feel lucky to watch/listen to Jago, Tumi Jago at daybreak by just switching on the TV (which is otherwise just an idiot box). Even better, having a father who breaks into a song at just the slightest provocation helps. Finally decided to visit Gwalior Ghat (wonder why is it called so) with Baba. Morning ride to Gwalior Ghat was exciting. For the uninitiated, Ghats are embankments where man meets the river. Ghats of Kolkata preserve an interesting piece of history, be it Princep Ghat, Babu Ghat or Gwalior Ghat. It, like any other important Ghat, ends with a deep drop to the river bed. Interestingly, there is a Gwalior Ghat in Varanasi too. Gwalior Ghat looked splendid in the early hours. 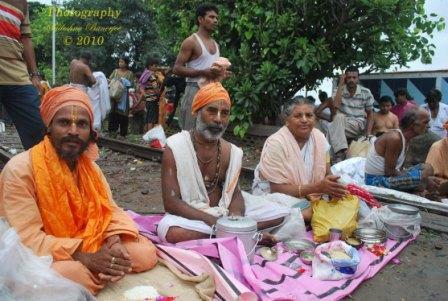 Hundreds of people gathered to offer Tarpan to their deceased ancestors. Interestingly, Tarpan is performed in an empty stomach while you offer food and sweets to your departed ancestors. Several priests, as usual, made hay even in the early hours of sunshine. My dad performed Tarpan too. Devipaksha (fortnight of the Godess) had a splendid start. Armed with a Nikon D60 and several lenses (lets leave the lenses specs to a separate post), I took some pictures while almost knee deep in mud. Was lucky not to soil my clothes. Shubho Mahalaya everyone! Please comment and let us know how did your Mahalaya go? We are sending this post as an entry to a wonderful event hosted by Pree – Beyond Five days of Durga Puja. Nice write up. Liked the early morning ghat-pics. Thanks man. Sadly, the closest encounter to a Kolkata ghat I have is when I boarded a ‘Launch’ nearby Howrah Station to go I-dont-remember-now-where. Now that I’ve seen the pics by Sudeshna, its all the more tempting. It was a good one.. nice to read as well enjoy the lovely pics !!! Thanks Banhi. How did you spend yours?